Climate Smart Glacier Country > Blog > Transportation > A Renewable Rail Superhighway through Glacier National Park? We can turn railroads into an economy-boosting, job-creating, air-cleaning climate solution! A provocative article in the on-line journal Grist this week shares an intriguing proposal to electrify Warren Buffet’s railroad through Glacier National Park and run it on renewable energy. 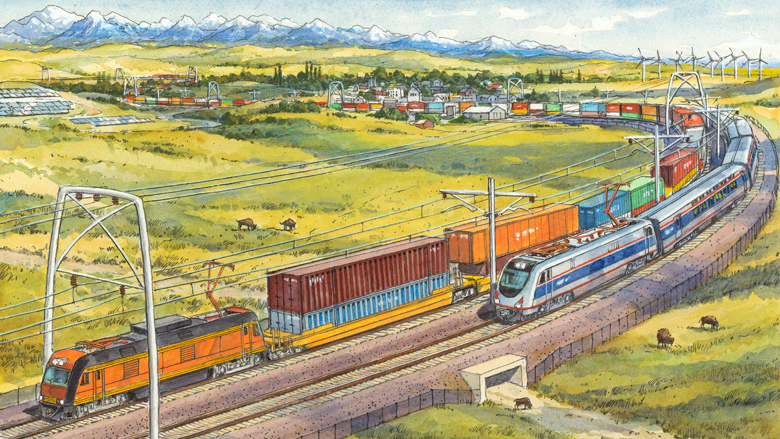 In addition to moving freight and Amtrak passengers without the diesel fumes, the rail corridor could deliver wind-powered energy from the Montana prairie along new long-distance, high-capacity transmission lines. The concept, called Solutionary Rail, has been developed by a team of rail experts, economists, and public interest advocates. The Solutionary Rail Team proposes a demonstration project on rail lines in the Northern Corridor between Chicago and the Pacific Northwest, which skirts the southern edge of Glacier. This line is mostly owned by BNSF, a property of Warren Buffett’s Berkshire Hathaway. Buffett is a big proponent of renewable energy and recently has invested huge sums in wind and solar technology. The group proposes to finance this through Steel Interstate Development Authorities, public agencies that would be able to raise low-cost capital from financial markets and take advantage of federal transportation dollars. The full concept has been fleshed out in a new book called Solutionary Rail, and it’s generating a lot of conversation and interesting questions. We have questions of our own, but our initial reaction is that this is a very exciting idea. And since Glacier has become an international poster child for climate change with its rapidly melting glaciers, this could be an ideal place to make it happen. Kate Igoe is the Co-Chair of the Climate Smart Transportation Working Group.